Tried and tested quality winning countless tech awards. MEDION® has a long history of developing and selling high quality products - resulting in countless renowned technolgy and innovation award over the past years. Awards for the best product, the bes quality-price-ratio or the editors' choice prove the high reputation that MEDION® holds throughout the specialized press. Great user recommendations and numerous four or five star ratings emphasize the high quality of our wide range products. 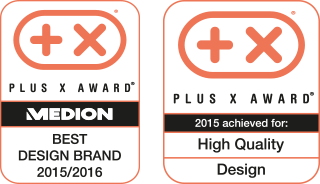 Even famous awards like the Plus X-Award or the Good Design-Award have been given to our products or to the whole MEDION company. We gratefully receive all this positive feedback from our customers and the press and will do anything it takes to continue earning that high level of trust and meet the huge expectations deriving from this. The Plus X Award is the world’s largest innovation award for technology, sports and lifestyle. Awards are given for new and innovative technologies, extraordinary design and intelligent, easy to use operating systems. 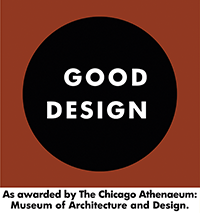 The annual GOOD DESIGN® Awards Program by the Chicago Athenaeum Museum of Architecture and Design and Metropolitan Arts Press Ltd. honors innovative and cutting-edge industrial, product and graphic designs from around the world. 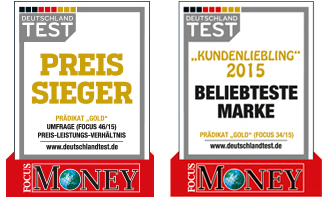 “Deutschland Test” is a subbrand of FOCUS MONEY, one of the most successful and prestigious business magazines in Germany. With independent and fair comparison of products and services, “Deutschland Test” is an important guideline for users and helps finding appropriate products for their needs. MEDION was honored with two awards: “Most favourite brand 2015” and “Best price-performance ratio”.